This sweet little lace dress isn't just your average lace dress: it features five darling velvet bows marching down the seam of the back! Mid-calf length, 3/4-length sleeves and a high neckline ensure that the dress is completely modest and requires no layering. Pullover styling with side zipper. ALL SALES FINAL. Available in raspberry, peony, and black. Not only is this dress beautiful, it is also comfortable! It does have some stretch to it. I love the bows on the back they make the dress so much more feminine! This dress is stunning! The gorgeous lace and bow detail are complimented with a marvelous fit. Great dress! This dress is stunning! The beautiful bows at the back and the length. The lace is gorgeous and it didn’t take long to arrive at all! Excited to wear this at our church convention. Bought this dress in November for a wedding. Received many compliments. Love the bow detail. 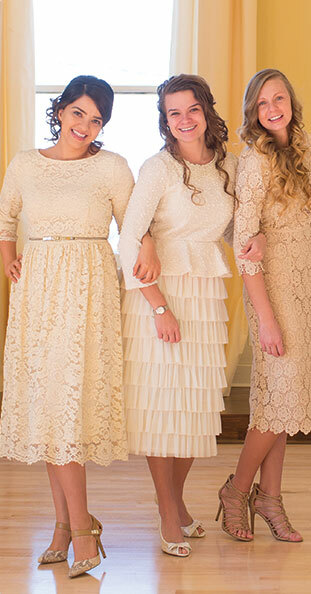 This dress is modest, feminine, classy, and would be appropriate for all special occasions. Such a beautiful dress, I've gotten many compliments and absolutely worth the buy! I love the back detail allot and the length is perfect and it's very comfortable! Lovely dress, perfect fit and color! I really like everything about this dress! !